Interview with John Pinto, Mayaguana, Bahamas. Maybe you’ve heard of Mayaguana, maybe you haven’t. It’s in the Bahamas but without the acclaim of Andros or the population of Grand Bahama. It hasn’t been on the TV like Abaco and doesn’t have the DIY repuation of Eleuthra. The place only has something like 312 people living there, but what it does have is some pretty intriguing bonefishing. You, a canoe and some double digit bonefish. Sound interesting? If it does, you might want to talk to John Pinto who has been fishing there for about 13 years. I sent John some questions about fishing there and about the bullet that Mayaguana appears to have dodged. Here are his responses. John, Mayaguana seems, for me at least, really far away and very hard to get to. What is the reality of getting to and from Mayaguana and why should the bonefish angler put Mayaguana on their list of places to check out? Mayaguana is easy to get to/from. Bahamasair offers three scheduled flights per week (M-W-F) from Nassau to Great Inagua/Mayaguana. There is a large Morton Salt operation on Great Inagua therefore the American executives need to fly back and forth on a regular basis so Bahamasair looks after that flight. There will be forty passengers on the flight and 33 get off/on at Great Inagua. The 7 who get off at Mayaguana is usually my group of anglers. 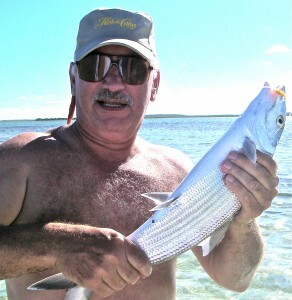 Mayaguana offers the best wade fishing opportunity for really large bonefish. It remains the closest thing to real “virgin fishing” left in the Bahamas. Stalking ten pound tailing bonefish is typically Mayaguanian fishing. We do it by wading or by canoe. Is there a fish from Mayaguana that stands out in your memory? I had an angler from Bakersfield, California there one time and his dream was to catch a tailing bonefish. He had a week of mishaps, had everything go wrong and I began to think he simply had a black cloud over his head. He and I went out one morning way before sun-up, the flat was like an oil slick and there were tailing/cruising fish everywhere. We stopped the canoe and got out, he grabbed his rod, turned around and there was a tailing fish working right to us. I held the canoe, we knelt down and I told him to put the fly in front of the fish. By this time the fish had closed to about twenty feet and I’m screaming for him to cast. From a kneeling position he basically cast nothing but leader, the fly plopped down in front of the oncoming fish and he inhaled it. This seven pound fish did everything as advertised, made two great runs and really put on a show before surrendering. I remember this fish because I have never seen an angler so happy about his first bonefish. At least seventy-five photos then followed the successful landing. With so few people around, is there anyone on Mayaguana you don’t know? How often do you run out of Kalik on the island (now that may be the most important question of all!)? In thirteen years we ran out of Kalik just once. The mail boat had broken down and the island was rapidly running out of everything including every brand of beer. Kalik is by far the most popular beer and is my favorite beer in the Bahamas. There's John with a Mayaguana Bone. I saw you mention the halting of the Mayaguana Development project. Over-development seems to be the major threat facing Bahamian Bones these days. Outline what that project would have meant for Mayaguana. I think the development would have changed the entire face of Mayaguana. There are not that many Bahamians on Mayaguana to begin with and they could conceivably become outnumbered by white Americans and Europeans in a short time. The development claimed it would create jobs for the Mayaguanians but I question what kind of jobs and how many. I think there would have definitely become a major caste system on the island between the locals and the landed gentry had the development been completed as planned. I was also concerned about the increased number of people who would have built homes there near the beaches and bonefishing areas. My greatest fear was finding the children of these new islanders racing around Curtis Creek on jet skis and altering the behavioral patterns of the bonefish. What’s your go-to rod/reel for bonefish these days? I prefer a 9-ft 8-wt 4-pc Stealth Bomber fly rod which are distributed throughout South Africa by David Levene Agencies. I use a Bauer M4 fly reel and Sci Angler fly lines. Is there something you’ve seen on Mayaguana that you haven’t seen anywhere else? Yes, the behavior of the bonefish in Curtis Creek on Mayaguana. Very large bonefish (10 to 12 pounders) will enter the creek system or hang over through the tide change and lay in the seams of the channels perfectly still. I know this because we almost canoe over them before they spook and scare the hell out of us. Over the years I know where these “lies” are and carefully work my way to them look for just a glint of a tail or fin. Very strange behavior that I have not found on any other island. Makes for some very challenging fishing. Thanks John… sounds very, very interesting. This entry was posted on Tuesday, February 1st, 2011 at 1:23 am	and is filed under Fish Tails, Locations. You can follow any comments to this entry through the RSS 2.0 feed. You can leave a comment, or trackback from your own site. The Bahamas should ban jet skis everywhere possible. They totally disrupt the life cycles on the flats. Too many times I’ve watched the idiots run through NO MOTOR zones in Florida. I guy on the poling platform isn’t standing up there for free. The numb skulls are afraid to venture out into deeper water because that’s were all the sharks feed, right. John, good luck staving off the destroyers, er developers. Had a computer crash and lost all your info. Looks like Mayaguana took a beating from Irene. Hope Shorty and the Byacaner survived, news reports are that 90% of he houses on the island were damaged. Lovely Bay was completely wiped out! No longer have the Lodge, but saved my driftboat. Guide you on salmon or steelhead? Here’s all my new contact info. Call me sometime? I went to Acklins last week to inspect after Irene’s passage. There was major damage to individual properties. NOT THE 90% AS REPORTED! The good news; power is restored over the length of the island. This will speed recovery. Acklins’ properties that survived the hurricane, are ready for the season! Mayaguana, as I undertood it, did very well…… very little damage! Shingles etc. HELLOOOOO!!!! JOHNCITO BONEFISH, I´M SO SO SOHAPPY TO HAVE YOU FOUND, MY DEAR FRIEND….PLEASE LET ME KNOW ABOUT YOU BY EMAIL. PLEASE SAY HELLO TO YOUR FAMILY. Might be interested in coming down to Mayaguana again. Getting older and I’m retired now. Looking to get out of the cold. Glad to hear the development failed, happy for the bones mostly. You still having flies tied in Nicaragua ? Send me an email, let me know what dates might be open. I don’t know that this is something John is going to see. This is my blog, not John’s site. You’ll have to contact him directly.